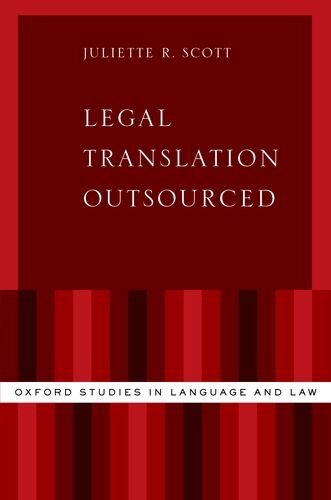 As a result of globalization, cross-border transactions and litigation, and multilingual legislation, outsourcing legal translation has become common practice. Unfortunately, over-reliance on such outsourcing has given rise to significant dangers, including information asymmetry, goal divergence, and risk. Legal Translation Outsourced provides the only current reference on commercial legal translation performed outside institutions. Juliette Scott casts a critical eye on the practice as it now stands, offering an analysis of key risks and constraints. Her work is informed by empirical data of the legal translation outsourcing markets of 41 countries. Scott proposes original theoretical models aimed both at training legal translators and informing all stakeholders, including principals and agents. These include models of legal translation performance; a classification of constraints on legal translation applying upstream, during and downstream of translation work; and a description of the complex chain of supply. Working to improve the enterprise itself, Scott shows how implementing a comprehensive legal translation brief--a sorely needed template--can significantly benefit clients by increasing the fitness of translated texts. Further, she opens a number of avenues for future research with an eye to translator empowerment and professionalization. View More In Law Practice.